Proprietary Name: Erygel What is the Proprietary Name? Non-Proprietary Name: Erythromycin What is the Non-Proprietary Name? Erygel with NDC 0378-8075 is a a human prescription drug product labeled by Mylan Pharmaceuticals Inc.. The generic name of Erygel is erythromycin. The product's dosage form is gel and is administered via topical form. FDA Application Number: NDA050617 What is the FDA Application Number? 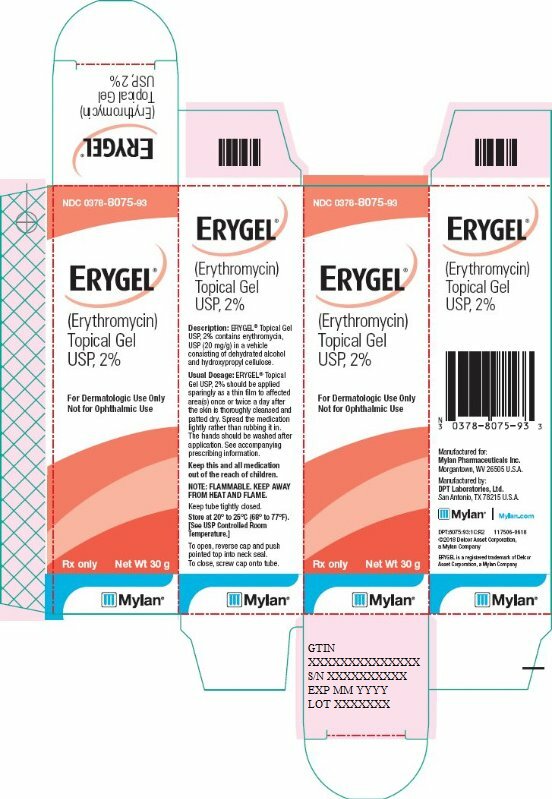 ERYGEL® Topical Gel USP, 2% contains erythromycin (3R*, 4S*, 5S*, 6R*, 7R*, 9R*, 11R*, 12R*, 13S*, 14R*)-4-[(2,6-Dideoxy-3-C-methyl-3-O-methyl-α-L-ribo-hexopyranosyl)oxy]-14-ethyl-7, 12, 13-trihydroxy-3, 5, 7, 9, 11, 13-hexamethyl-6-[[3, 4, 6,-trideoxy-3-(dimethylamino)-β-D-xylo-hexopyranosyl]oxy]oxacyclotetradecane-2,10-dione), for topical dermatological use. 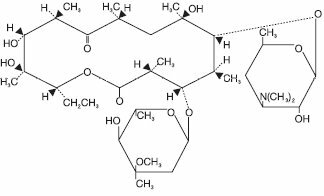 Erythromycin is a macrolide antibiotic produced from a strain of Saccaropolyspora erythraea (formerly Streptomyces erythreus). It is a base and readily forms salts with acids.Chemically, erythromycin is C37H67NO13. It has the following structural formula:Erythromycin has a molecular weight of 733.94. It is a white or slightly yellow, odorless or practically odorless, bitter crystalline powder. Erythromycin is very soluble in very polar organic solvents such as alcohols, acetone, chloroform, acetonitrile and ethyl acetate. It is moderately soluble in less polar solvents such as ether, dichloroethylene and amyl acetate. It is slightly soluble in nonpolar solvents such as hexane. It is very poorly soluble in water.Each gram of ERYGEL® Topical Gel USP, 2% contains 20 mg of erythromycin, USP in a vehicle consisting of dehydrated alcohol and hydroxypropyl cellulose. Erythromycin acts by inhibition of protein synthesis in susceptible organisms by reversibly binding to 50S ribosomal subunits, thereby inhibiting translocation of aminoacyl transfer-RNA and inhibiting polypeptide synthesis. Antagonism has been demonstrated in vitro between erythromycin, lincomycin, chloramphenicol, and clindamycin. ERYGEL® Topical Gel is indicated for the topical treatment of acne vulgaris. ERYGEL® Topical Gel is contraindicated in those individuals who have shown hypersensitivity to any of its components. Pseudomembranous colitis has been reported with nearly all antibacterial agents, including erythromycin, and may range in severity from mild to life-threatening. Therefore, it is important to consider this diagnosis in patients who present with diarrhea subsequent to the administration of antibacterial agents.Treatment with antibacterial agents alters the normal flora of the colon and may permit overgrowth of clostridia. Studies indicate that a toxin produced by Clostridium difficile is one primary cause of “antibiotic-associated colitis”. After the diagnosis of pseudomembranous colitis has been established, therapeutic measures should be initiated. Mild cases of pseudomembranous colitis usually respond to drug discontinuation alone. In moderate to severe cases, consideration should be given to management with fluids and electrolytes, protein supplementation and treatment with an antibacterial drug clinically effective against C. difficile colitis. For topical use only; not for ophthalmic use. Concomitant topical acne therapy should be used with caution because a possible cumulative irritancy effect may occur, especially with the use of peeling, desquamating or abrasive agents.Avoid contact with eyes and all mucous membranes.The use of antibiotic agents may be associated with the overgrowth of antibiotic-resistant organisms. If this occurs, discontinue use and take appropriate measures. Patients using ERYGEL® Topical Gel should receive the following information and instructions:1.This medication is to be used as directed by the physician. It is for external use only. Avoid contact with the eyes, nose, mouth, and all mucous membranes.2.This medication should not be used for any disorder other than that for which it was prescribed.3.Patients should not use any other topical acne medication unless otherwise directed by their physician.4.Patients should report to their physician any signs of local adverse reactions. No animal studies have been performed to evaluate carcinogenic and mutagenic potential, or effects on fertility of topical erythromycin. However, long-term (2-year) oral studies in rats with erythromycin ethylsuccinate and erythromycin base did not provide evidence of tumorigenicity. There was no apparent effect on male or female fertility in rats fed erythromycin (base) at levels up to 0.25% of diet. There was no evidence of teratogenicity or any other adverse effect on reproduction in female rats fed erythromycin base (up to 0.25% of diet) prior to and during mating, during gestation and through weaning of two successive litters. There are, however, no adequate and well-controlled studies in pregnant women. Because animal reproduction studies are not always predictive of human response, this drug should be used in pregnancy only if clearly needed. Erythromycin has been reported to cross the placental barrier in humans, but fetal plasma levels are generally low. It is not known whether erythromycin is excreted in human milk after topical application. However, erythromycin is excreted in human milk following oral and parenteral erythromycin administration. Therefore, caution should be exercised when erythromycin is administered to a nursing woman. Safety and effectiveness in pediatric patients have not been established.Keep this and all medication out of the reach of children. In controlled clinical trials, the incidence of burning associated with erythromycin topical gel USP, 2% was approximately 25%. The following additional local adverse reactions have been reported occasionally: peeling, dryness, itching, erythema, and oiliness. Irritation of the eyes and tenderness of the skin have also been reported with the topical use of erythromycin. A generalized urticarial reaction, possibly related to the use of erythromycin, which required systemic steroid therapy has been reported. ERYGEL® Topical Gel should be applied sparingly as a thin film to affected area(s) once or twice a day after the skin is thoroughly cleansed and patted dry. If there has been no improvement after 6 to 8 weeks, or if the condition becomes worse, treatment should be discontinued, and the physician should be reconsulted. Spread the medication lightly rather than rubbing it in. There are no data directly comparing the safety and efficacy of b.i.d. versus q.d. dosing.